Junior Royalty Candidates – Hopkins Raspberry Festival! We are looking for a “Few Good Raspberries” to join the next Royal Family to represent the city of Hopkins! 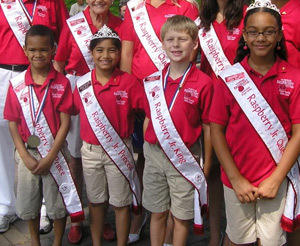 If you live in Hopkins School District #270 and are 6 years old but not 9 as of July 1, 2019 you are eligible to become Hopkins Raspberry Festival Junior Royalty! This program is not a pageant! It is a program that is recognized by other festivals state-wide because it allows a shy child to shine and become more self-confident. It also allows a very outgoing child to work well within a group setting. Children learn from each other with guidance and things that may have been obstacles, are now easily overcome with the support of other children within the group. The program is very fun and is based on letting kids be kids. Every child is different in so many ways and that is what makes this program so important. The program embraces who they are as a child. Only two children will be crowned Royalty but every child comes out of the program with a wonderful experience! Participate (ride) in the Grande Day Parade! If chosen, be crowned as Royalty!